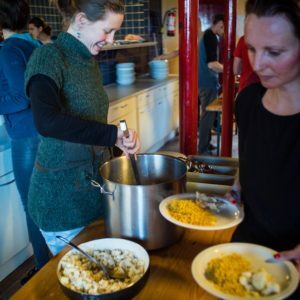 PaascroYoga 2019: April 19-22, is sold out! We do not have a waiting list. You can try to purchase a ticket from somebody else, through our Facebook page for example. In this case send us an email with your name, date of birth and the name of the person you bought the ticket from. Please also include them in the CC. We want the festival to be accessible for the whole family! 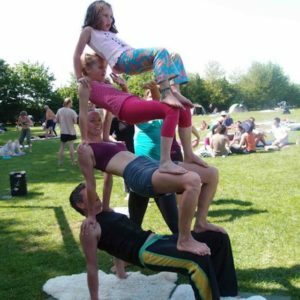 For kids we have special workshops by teachers trained in Family AcroYoga, there is an Easter-egg hunt and a small price for the small people. These tickets are for kids between 4 and 14 years old. Younger kids, (that do not take up a bed) can join for free. We need 30 Karma-Yogis to make the festival run smoothly! If you come as a Karma yogi you help one shift during the weekend. Your task will mainly be helping the chefs with the preparation of the food, doing the dishes, and some small cleaning tasks. It will be a shift of about six and a half hours from either early morning to lunch or from lunch until after the dinner clean-up. In exchange you get your ticket a little cheaper ánd you get a lot of gratitude from the hungry AcroYogi’s! If you feel like contributing, please buy the Karma-yogi ticket, we really appreciate your help!! * As part of your Karma Yoga task we ask ALL Karma Yogis to arrive at the festival on Friday 16:45 so we can introduce all the Karma Yogis to our amazing chef, brief you on the task and help us place the mats in the halls. Not from Netherlands, Germany or Belgium? If you do not have a Dutch, German or Belgian bank account, please send an email to administration@stichtingacroyoga.nl with the full name and date of birth of all the people you would like to buy tickets for, and what kind of ticket(s) you want. Then we send you the bank details to transfer the money.